Welcome to our website - come and join us! The Branch made two donations to charities close to Lindsey's heart. I am writing on behalf of Chilterns Dog Rescue Society to express our sincere thanks for the donation of £50 in memory of the late Lindsey Worley. We truly appreciate the fact that LIndsey's friends and colleagues at the Basset Hound Club chose to remember her in this way and hope she would have been pleased to know how much support of this kind has enabled us to achieve for dogs in need. Please pass on our thanks to all the members for their support for our rescue and rehoming work. 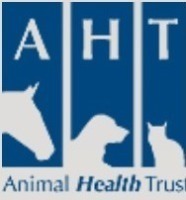 .................... None of the AHT achievements would be possible without your donations and we are immensely grateful for your help in improving animals' lives now and in the future. 3. 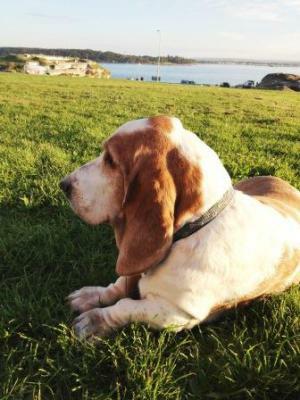 The Animal Health Trust, Newmarket – Give a Dog a Genome - Specifically for Basset DNA sequencing or research into Glaucoma in Bassets. From Veterans with Dogs: I write to thank you personally and most sincerely for the donation received of £50 towards our charity. ​ It was a wonderful gesture and I kindly ask you to pass on our thanks to your branch members for voting to donate to us. ​ As a small charity, the majority of our supports comes from public donations. Your kind gesture enables us to continue providing a vital lifeline for our clients. Support from like minded clubs such as your branch of the Basset Hound Club is wonderful, so thank you for helping us to continue our important work enabling veterans to live fuller, independent lives. ​ Rest assured our support and services for veterans with their dogs is growing and we appreciate your kindness. ​From Hearing Dogs for Deaf People: On behalf of all of us at Hearing Dogs I should be grateful if you would pass on my thanks to everyone at the L&NHC Branch of the Basset Hound Club for the kind gift of £50.00 towards our work. Your special gift will help us place more dogs to help more deaf people like John and Theo. John says “Before I had my hearing dog, I used to walk around with my head down, so as not to gain eye contact so that I wouldn’t have to speak to people. I used to leave it to my family, whoever I was with, and I would just stand back in the side line and switch off. Now I have Theo, I feel as though my life has completely changed and opened up again. Theo is worth his weight in gold and the wait for him was well worth it. He has given me a new lease of life”. 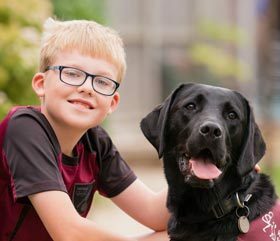 Thank you for your support and helping us to continue the valuable work of Hearing Dogs. donation cheque for £50.00, made by you on behalf of The London & Northern Home Counties Branch of the Basset Hound Club. This donation will be ring-fenced for our ongoing work into glaucoma and goniodysgenesis in the breed. Many thanks for the contribution and interest in our canine heritable disease research here at the trust. April 2016's AGM saw the membership approving donations of £50 each to four charities - Animal Health Trust, Newmarket; Pets as Therapy, High Wycombe; National Animal Welfare Trust, Watford branch and Blue Cross, Kimpton, Hertfordshire. We have received thanks from all. From the AHT: Please thank the Basset Hound Club L&NHC Branch for their very kind donation of £50 towards our glaucoma research in Bassets. James is due to spend an extended stretch of time working on his PhD over the summer and beyond, and the Basset is one of the breeds he will be focusing on, so I hope we will be able to provide you with a useful update in a few months time. From Pets as Therapy: We acknowledge with grateful thanks your kind donation of £50.00. Your generous donation will be used to further the work of Pets As Therapy, and we do hope you will continue to support our endeavours. From the NAWT: On behalf of the National Animal Welfare Trust I would like to thank you for your generous donation of £50, it is greatly appreciated. Your donation will truly make a difference in the animals lives at the centre. The goal of the National Animal Welfare Trust is to make a difference in the welfare of the animals. Donations like this make such a difference to all our animals waiting for their forever home. It will help us continue to give the best care we can to our animals. Your support means a great deal to all of us here at the Trust. From the Blue Cross: On behalf of the entire team at the Blue Cross, I would like to express our sincere thanks and appreciation for the wonderful donation of £50. This year so far Hertfordshire Blue Cross Rehoming Centre has helped 132 dogs, 92 cats and 39 rabbits and guinea pigs. Support from organisations such as yourselves is greatly appreciated and means we can continue helping animals in need. I would like to thank the Basset Hound Club London and Northern Home Counties for the generous gift of £50 in support of Medical Detection Dogs. Your support will help us to continue our ground-breaking charitable work which includes investigating the potential of dogs to assist medics in the early detection and diagnosis of cancer and other human diseases. 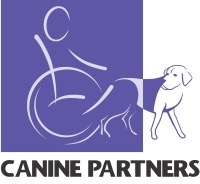 Our work also includes the training and placement of specialist Medical Alert Assistance dogs that alert their clients prior to a medical emergency allowing them to lead a more normal life with increased independence and confidence. Since we began in 2008 we have managed to train and place 60 Medical Assistance Dogs, our aim is to place another 16 such dogs in 2015. As you can imagine, there is a great deal of demand and interest in the work that we do particularly following our recent ‘Telegraph Appeal’ publicity. Once again, thank you very much for your kind donation and support, it is most appreciated. On behalf of Chilterns Dog Rescue Society, I would like to thank you for the very kind donation of £50.00 to the Society as voted at your AGM by the members of the Basset Hound Club London & Northern Home Counties Branch. This is very much appreciated and will go directly towards supporting the dogs in our care. The Rescue Centre is at full capacity at the moment. We have dogs from 4 months up to 7 years old and everything in between. Some of these dogs are ready to leave us when the right home comes along and others require further training and veterinary care. The staff are working exceptionally hard with the help of volunteers to get all of the dogs out for walks. They then hold additional training and play sessions with as many of them as possible. There is also the day to day maintenance of the kennels, so we are extremely busy and your donations are vital at this time to support the dogs in our care. The redevelopment of the kennels is going well. The structures are up and the roof tiles have arrived and are ready to start going on this week. While there is still a lot of work to do it is very exciting to see the new kennels taking shape. Thank you very much for your donations totalling £80 towards the Animal Health Trust's research into Glaucoma in Bassets. Cathryn Mellersh and James Oliver are very grateful. It is only with the generous support and commitment of breed clubs such as the London & Northern Home Counties Branch of the Basset Hound Club that we are able to engage in pioneering projects and further our understanding of these distressing conditions and how they affect particular breeds. As you will know, primary glaucoma, linked to the inherited eye abnormality goniodysgenesis, is a problem which affects an estimated 1,500 dogs each year, with the majority having to have both eyes removed. The AHT wants to try and prevent this from happening by better understanding this condition, which breeds are affected, and the genetics involved. By collecting DNA samples from dogs diagnosed with glaucoma, dogs diagnosed with goniodysgenesis and dogs over the age of five clear of goniodysgenesis, geneticists at the AHT hope to make significant steps towards identifying the mutation/s responsible for goniodysgenesis and developing a DNA test to identify which dogs might be at risk of developing glaucoma and of those passing those genes on to their offspring. None of the AHT's achievements would be possible without donations and we are immensely grateful for your help in improving animals' lives now and in the future. Thank you very much for the donation of £50 from the L&NHC Branch of the Basset Hound Club towards James Oliver's glaucoma project. Our sample collection from Bassets is going very well and we will soon be in a position to start some lab work on that project, so the donation will get put to good use. 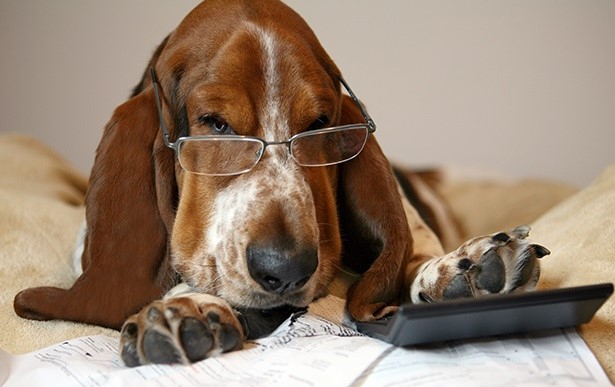 Please convey our sincere thanks to your committee and members for the very kind donation of £50 from the Basset Hound Club (L&NHC) towards James Oliver's study into glaucoma in Bassets, which you sent to Cathryn Mellersh. As you know, the Trust receives no government funding and relies on the generosity of its friends and supporters to enable it to continue its pioneering work for the improved health and welfare of our companion animals. 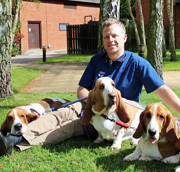 We hope that James's research into glaucoma will help us better understsand this distressing condition which affects Bassets as well as other breeds, and your donation is very much appreciated. Once again, our sincere thanks for your support. Many thanks for your generous donation of £50 from the London and Northern Home Counties Branch of the Basset Hound Club. We’re very grateful for your kind gift which we have put towards our blood donor programme, as requested. This vital service really is at the heart of the ground-breaking work carried out at the QMHA. So many of the pets we see, across all specialities within the hospital, require urgent blood transfusions which would not be possible without the Blood Donor Programme, so donations like yours really do make a difference to thousands of animals each year. Many thanks once again for your kind support of our work. The Queem Mother Hospital for Animals treast thousands of critically ill cats and dogs every year with severe conditions such as autoimmune blood disorders and toxicities. Our pioneering donor programme helps keep these animals alive. Many of the innovative treatments carried out at the QMHA rely on the transfusion of donated blood. The only commercial supplier in the UK is unable to keep up with our demand so we have to source the blood we need ourselves. The Donor Process To source the blood we need to provide out life-saving services, we rely exclusively on the goodwill of local pet owners who bring their pets (cats and dogs) to donate blood; they are not paid for this service. We currently have 82 dogs and 26 cats on our donor register. However we have an ongoing recruitment process as we only allow pets to donate blood for a limited period of time. All of our donors go through a rigorous screening process where we ensure that they would not be distressed by donation and that they are healthy. Our donors are given full health checks before donations and a full blood screening is performed free of charge annually. Once we have collected blood from a donor, we process it in such a way as to make the very most of it - we separate the blood into red cell units and plasma units in order to ensure patients receive exactly what they need. Funding Needs We urgently need a new blood centrifuge for the blood transfusion service. This is a vital piece of equipment for us as it is used to separate the blood cells from the plasma in donated blood, so we can ensure it is all used as efficiently as possible. A new centrifuge will cost £25,000. Our current centrifuge was donated to us by the NHS and has served us well for many years, however it is now reaching the end of its useful life and is becoming expensive to maintain. I write to express our sincere thanks for the L&NHC's Branch of the Basset Hound Club kind & generous donation of £50. Your gift will go towards the care of all our animals, helping us maintain their health and welfare so we can ultimately find them wonderful, loving new homes. ​It is with great sadness I let you know that Lindsey Worley, committee member and wife of our Chairman John, died a few days before Christmas. Our thoughts are with John and son Mark. The funeral took place on 3 January. ​The funeral of Mary Browne, President of the L&NHC Branch, took place on Monday 19 May 2014 at West Herts Crematorium, Watford. In her memory, the Branch sent donations to Hearing Dogs for Deaf People and Alzheimer's Society. In April 2014, the Branch tragically lost its Treasurer, Neil Shayler. A touching memorial service was held on Friday 16 May 2014 at St Andrews, Ampthill, which was packed out with his many local community friends, colleagues, relatives and Basset friends. ​In memory of Neil, the Branch sent donations to Diabetes UK and Dogs Trust. ​​30 June 2016 "Delta is no longer with us – she has gone to join up with her sadly missed sister/alter ego Dollar in Basset Hound Heaven (at least I hope there’s such a place for her). She has not really been that well lately and since the walk and picnic at Milbrook she went rapidly downhill. As you may have been aware she was blind due to cataracts but her health was failing in general and doggy dementia had crept in. 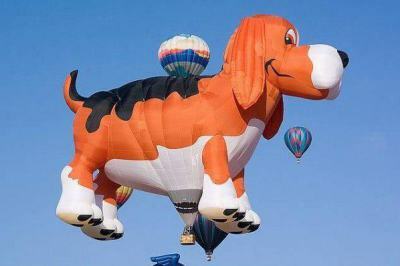 She had also lost her appetite – an unthinkable thing for a Basset! We took her to the vet last Monday, 27 June, and he agreed it would be a kindness to let her go". 5 July 2016 "We lost Venice this morning - a mix of heart, spleen and cancer. She was distraught when Delta went and I think that was the last straw. She was born on 6 June 2004. We had eight great years with her and miss her sorely." 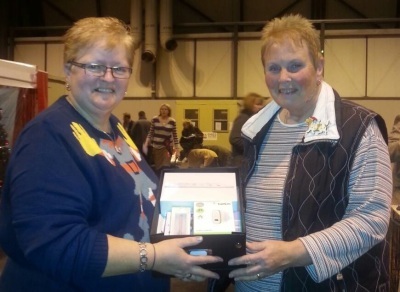 L&NHC Branch secretary, Linda Skerritt, wins first prize of an i-pad mini and accessories on the Basset Hound Health Group raffle which was drawn at Ladies Kennel Association championship show at the NEC, Birmingham, on 13 December 2015. Raffle tickets had been on sale since May when first advertised on our Branch website, available from Linda, so she is especially pleased that the prize went to within our Branch. Make sure you buy some next time round - you could be the winner! A very Happy Christmas and Best Wishes for the New Year. We are now settled in Wales, no more Bassets still only 6! But we now have 12 chickens (6 silkies) 6 ex barn/cage hens and a cat!? Harvey will be celebrating his 13th birthday on 3rd May. He is more adorable by the day, as he loves as much attention as he can get. He has his young dog days and then the old ones, but is as healthy as ever, other than the loss of hearing, some arthritis and a little incontinence! We have a wonderful vet, who Harvey is more than happy to see on his regular check-ups. That's a huge turnaround as I used to have to drag him into the vets. Andy and I became citizens of Australia last year and have really settled here. We are planning a long weekend away in June (winter here) in a beach house with Harvey. He loves the sand and the cooler weather. Best wishes to all our friends at the Basset club.